The hordes of the undead and creatures of the night definitely go in and out of popularity faster than global hyper colour t-shirts. It's seems like only yesterday that Vampires where the undead du jour, there was a brief spate of werewolf popularity, then non-threatening vampires and now zombies are bloody everywhere, shambling about the place trying to catch Pokémon. Well it's seems about time that the modern day vampire hunter makes its resurgence. It seems so long ago that I was watching Buffy, Dracula 2000 and John Carpenter's Vampires, most of which have not stood the test of time and so it's about time that the concept of trained tooled up humans killing bloodthirsty creatures of the night came back and that's just what Vampire Hunters is doing. I've referenced loads of 90s vampire movies but the film I think Vampire Hunters most resembles is Repo Men, as you'll infiltrate a filthy den of bloodsucking scum and try and blast them back to hell before they all wake up and paint the walls with your intestines. The version I played of Vampire Hunters was not the final version, not even close. The miniatures and tokens where stolen out of Mansions of Madness, the floor tiles poorly cut squares of paper and when I got bored of cutting up cards I wrote a number on them and used a dice. This means I can’t comment on the game’s components, except to say the artwork is good and suits the atmosphere. 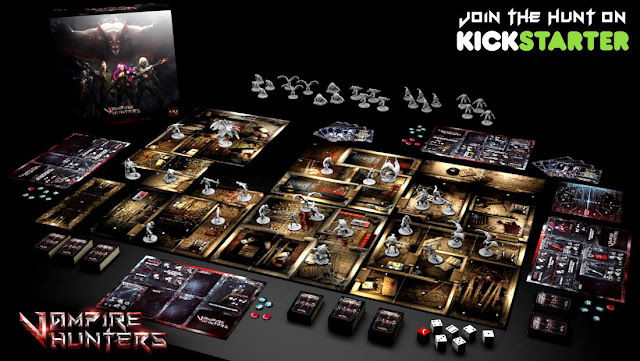 Although Vampire Hunters is scenario based, the majority of the gameplay remains the same - creep into a vampire nest during the day and hope to complete your objective before waking all the blood sucking fiends and they see you as pizza delivery boy and pizza in one. You’ll explore their hive hoping to find your objective quickly and dispatching as many creatures of the night before night falls. This is what makes the game both tense and difficult as you are working against the clock, trying to get to your objective both quickly and efficiently. Occasionally you’ll have to wake up the odd vampire and then you have a problem on your hands, a problem with very pointy teeth heading your way. On the surface, Vampire Hunters is your typical dungeon crawler. All the hallmarks are here; exploration, monster killing and a big bad boss monster, but it’s not just the change of theme from fantasy adventurers to modern day vampire hunting that makes this game different. For starters there’s the concept of day and night, where the game is easier and more forgiving during the day, but cranks up a notch once darkness falls. Second the enemies are extremely aggressive; if there’s a vampire on the board it’s going to be attacking you very soon and it’s easy to get overrun if you aren’t managing those bloodthirsty critters. Another interesting aspect of Vampire Hunters is focus. Focus is spent when using special abilities, activating special weapons and building weapons from scavenged equipment. You can also save focus for the end of the current scenario where you can use it to buy new special abilities. Gaining focus is easy in theory, kill vampires and succeed in objectives but of course you’ll have to use them and your equipment sparingly if you want to defeat an elder. The elder is the big bad guy, the cream of the crop, the alpha vampire and he’s one tough mother-sucker. Not only does he soak up more damage, and hit back harder you also have to draw an elder card before you can try and hit him. Think of these cards as similar to the sanity test in Arkham Horror, they represent the elder being such a fear invoking monster that you have to pass some form of test just to point your crossbow in the right direction. My problem here is the elder can appear randomly, and on my first game appeared in the very first room I explored. My poor inexperienced vampire hunters didn’t last long after that. Of course the hunters have tools to help them defeat the blood sucking scum. Grenades, light bombs and UV tridents are all part of a hunter's arsenal but they can also take advantage of their surroundings such as taking cover behind barricades and even breaking windows to allow the sunlight in and turn the vampires to flambé. Vampire Hunters is really all about risk, you can try and move through the vampire’s nest quickly, searching out your objective, but if you do you’re going to have discovered a lot of sleeping vampires and as soon as night falls you’re in trouble. Alternatively, you can take your time, going through each room systematically, eliminating all vampires as you come across them. The problem is this takes time, of which you don’t have much. 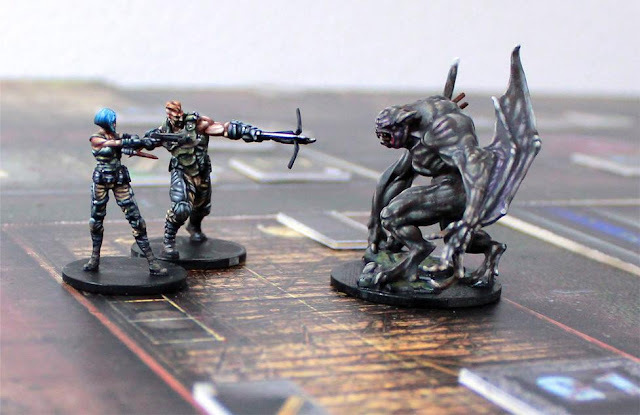 This all comes together to form the hallmarks of a great cooperative miniatures game. The version I played was still in development, so there are a few places where the rulebook could be improved for clarity, but on the whole the game runs rather smoothly with very few circumstances of game breaking rules conflicts. Now this game is definitely two feet into the Ameritrash camp, there's cards for everything, tokens everywhere, many a roll of the dice and not a single wooden cube in sight. This of course can make the game a bit fiddly on the tabletop but it's still much less than many games of its ilk, something Dark Gate games should be proud of. It also means there is a lot of randomness to the game but I never felt that I wasn't in control of my own destiny. Fighting the Elder vampire may have felt like a complete slog but at the same time it's the big boss monster, it's supposed to be difficult. It's an early game and due to its prototype nature and time pressure of getting a Kickstarter review out while the project is still running means I have only played a couple of games of Vampire Hunters. So here's the litmus test, let's imagine I had played this game at a gaming convention on a demo stand, would I be stumping up the readies and paying to take this game home with me? The answer is yes, this game would be in a bag and in the boot before you can say "I miss Buffy". This Kickstarter preview is based on a print and play prototype version of the game; the final product may look, play or smell different to that used in this preview.